The shipping address of the polar publishing house is further down on this page. While I am travelling during the season, I am unable to answer letters. Emails will be answered with a little delay of some days. 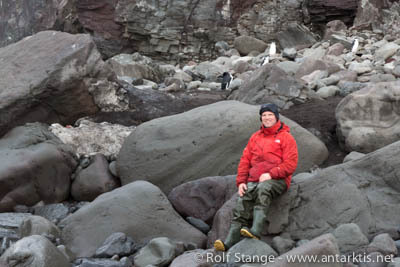 Rolf Stange on a beautiful sand beach in Antarctica. Saunders Island, South Sandwich Islands, to be precise. Everything is bigger down there, including the sand grains.